Many of us hold irrational fears, we often dislike things but are not quite sure why. One of the most commons things people in this country seemed to be scared of/hate (use interchangeably as you wish) are ‘illegal immigrants’. When we hold onto these fears, we look for proof that they are not irrational. As a result we start to believe things that to the objective eye are flagrantly not true. Sad isn’t it? It’s about time we put our own people first. Please have the guts to forward this. I just did. If true, then this would be truly shocking. Millions of people around the globe have read this and been so outraged that they have decided to forward it on. Significantly they have believed it to be true. People are that impressionable. Spam emails are largely created to get you to forward them on so will largely be sensationalist and what is, or is not true rarely plays a part. Just as there probably is not a Saudi prince offering you millions of pounds, nor a pill to guarantee you that extra “length”, I can assure you here and now that ‘Illegal immigrants’ do not receive more money than our pensioners. “Illegal immigrants” are individuals who have entered the UK unlawfully, or who have stayed here for longer than they were allowed without making another visa application. They do not have the right to work. Since they are in the UK without legal status, they are liable to be removed if they come to the attention of immigration authorities. This means anyone here “illegally” cannot claim benefits in the same way someone who is allowed to be here can. People who require leave to enter or remain in the UK, but who do not have it, are ‘persons subject to immigration control’ and as such are not eligible for social security benefits. “Refugees” – i.e. an asylum seekers whose application for asylum has been successful – are able to claim social security benefits and tax credits on the same basis as UK nationals, but may find it difficult to gain entitlement to contributory benefits since these depend upon the person having a sufficient contribution record. In other words, they will be entitled to the lower, less generous non-contributory payments. The figures in the email bear no relation to any UK out-of-work benefit rates. The current rate of income-based Jobseeker’s Allowance for example, is just £65.45 a week for a single person aged 25 or over, or £102.75 for a couple. Asylum seekers – i.e. persons waiting for a decision on an asylum application – are not entitled to mainstream non-contributory social security benefits including income-based Jobseeker’s Allowance, Income Support and Housing Benefit. Instead, they may be eligible for accommodation and/or financial support from the UK Border Agency. Cash support for asylum seekers is less generous than social security benefits; for example, a single person aged 18 or over currently receives £35.52 a week and a couple £70.34 a week. This has to cover, travel, food and all day to day expenses. And we wonder why people turn to illicit means to supplement this meagre income? Retirement Pension – is less than the Pension Credit Guarantee Credit may be able to get their income ‘topped-up’ to that level. The Pension Credit Guarantee Credit for a single pensioner is £132.60 a week, and £202.40 for a couple, but further additions may be payable for disability and/or carers. In my humble opinion this is nowhere near enough. All pensioners should receive a minimum basic non-means tested minimum of around £150-200 a week pension (£300 for a couple). As the spam rightly points out, these are people who have paid into the system their whole lives. Equally though, I passionately believe we need to provide more for ALL of the above mentioned categories of “immigrants”. At the moment, failed Asylum Seekers are often forced into destitution, families are going hungry and we are forcing people into the hands of the criminal underworld. What I hope to have illustrated is that not only is Spam generally not true, but it also targets the the irrational fears that many hold onto. It plays on people’s fears and drives divides within our society. Believe me when I say the EU does not regulate on the sale of cabbage, this government is not introducing Sharia law and immigrants do not receive massive handouts and live in country estates. Think before you forward on this sort of hate filled rubbish. content from other authors and practice something from their websites. Sue is entitled to an opinion an it is NOT racist to want your own country predominantly to be of ones own people and religion it is national identity. But the fact is the whole world is vastly too overpopulated, we need to set restriction on migration and birth. And let us not forget the LAW is asylum seekers MUST go to the first country they arrive at after leaving theirs. If the majority cross through 4-8 countries, or leave decent homes with work to come to england then ask why? what is it that welcomes them here? the land of milk an honey i guess but the uestion is what is that milk an honey in real terms? Is English your first language Sue? Or are you illiterate? And is this woman in the benefits office you spoke to fictional? If she does indeed exist I suggest you report her to her manager for 1) Not having any idea at all about the benefits system and therefore her job 2) Promoting bigotry by lying 3) Sharing client’s confidential information with cretins. There was a Times news piece saying that people born in the UK are now in the minority in London and it is immigrants who have effectively grown in size to surpass them. Is this true? If it is in the Times it maybe true, but try the Government website or your MP? What I find so pathetic is that we live in a democracy, vote for MPs then do not Email them to check if the details are correct or not. There are many people in this country enjoying a very nice life style thanks to the DSS. That is why HMG is trying to limit DSS payments to £26K p.a. hardly a sum that applies to OAPs who have worked and paid National insurance all their lives. So I urge you to email your MP and complain about the issues affeting you in your old age. How about asking if the spam is correct. If the highways agency intends to remove the tolls a Dartford River Crossing and fine you £60 every time you fail to pre-book. Its your money so stop things happening before MP come up with another bright impractical idea. You want democracy use it and send everyone a copy of your MP’s reply. Spot on. One has to wonder, who was the guy who first sat down and wrote all this? And why? Well put Russ my old friend. Good stuff Steve – keep on blogging. I just arrived in Bangladesh without the correct visa. The Bangladeshi immigration officer was incredibly helpful, trying to explain in English (not his language) the correct forms to fill, and went out of his way to get me correctly registered in the efficient computerised system (they had my photo and records of my last visit on the system). All without asking for a bribe – just ‘have a nice stay and thank you for visiting our country’! Would a Bangladeshi who had made a stupid mistake get the same treatment at our border? no cause he or she would not have seen immigration they tend to bypass that sort of thing a foreigner came to bye a car of a friend of mine and said he wanted it but could he wait till the 5grand check he got of the government to by a car so he could look for work cleared so what is the truth the truth is there are to many foreigners in our country that is FACT. Your comment is laughable John. Both the content and use of the English language. I did not realise that this level of ignorance and stupidity still existed. FACT! I was just thinking about that racist nonsense, John. I first heard that one three years ago. Did this friend of yours sell him the car, then? Did you see this five grand cheque? actually ive spoken to a lady who works in the benefit office and she was disgusted that they DO GET MORE MONEY, and also someone above her in there office had to agree with one of the local shops that the social would pay for some foreigners shopping because they did not have enough money would they do that for one of us NO I THINK NOT. they walk as if they own the place with the latest trainers on, push in, make people afraid to go out after dark coz there intimidating. i agree go home. I can’t believe people like you actually exist. How can you have lived your life up to now being so ignorant / racist etc. Why do you think you are more entitled to live here than anyone else? i think we could do with a lot less lying bigotted morons like you ‘sue’ to be honest, maybe then the rabid racists wouldn’t get a look in the door when these issues need serious debate and discussion. Spam e-mails are often remarkably easy to spot. They’re littered with grammatical errors, they have clearly bogus links, they ask for personal information. It still amazes me that so many people get taken by them. Nobody’s contacting you out of the blue to split a $5,000,000 payment with them. 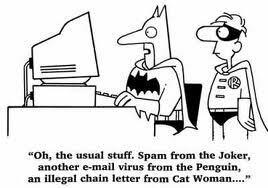 A little basic research could easily prevent the majority of issues that result from spam.